Starting today, Cherry Mobile is holding their three day Promo. 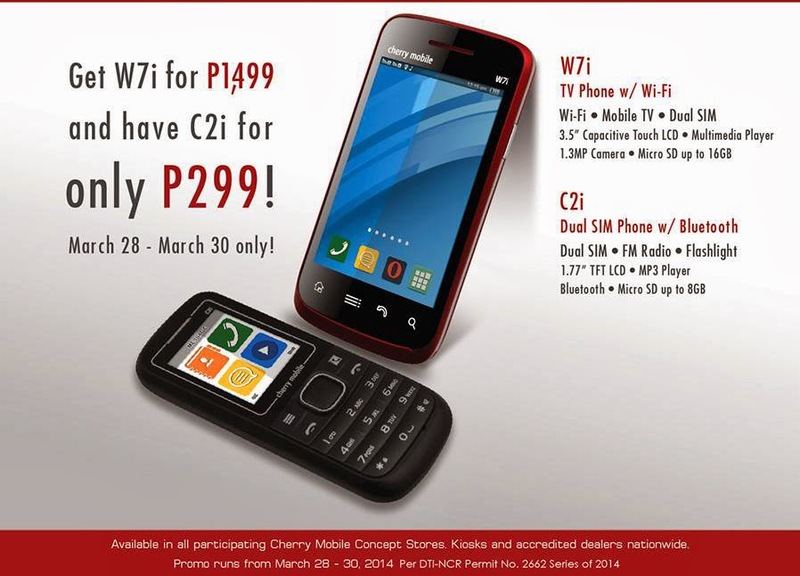 In every purchased of W7i TV/Wifi phone for Php1,499, consumer can get a C2i for only Php299. To summarize, the Cherry Mobile W7i is a 3.5 inches HVGA Touch Screen LCD (320X480 pixels), Wifi,built in TV, FM Radio and Music Player. Theres also a 1.3 Megapixels camera and support MMS, Bluetooth and GPRS Class 12. The C2i is a Dual SIM Phone packed with Bluetooth, Flashlight, FM Radio and MP3 Player. Promo runs from March 28-30 in all participating Cherry Mobile Concept Stores, Kiosks, and Accredited Dealers Nationwide.